There is a house at the beginning of the Steingasse, just at the start of the Imberg staircase leading to the Capuchin Monastery, which is known as the Joseph Mohr Birthplace. 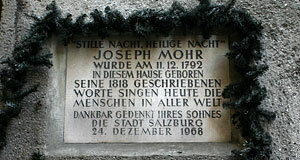 A great claim to fame, sine Joseph Mohr is the man who wrote the lyrics for the Christmas Carol "Silent Night". Back then, he was a priest at the small community of Oberndorf north of Salzburg. Alas, the birthplace-claim might well be undeserved - years ago, historians have identified the origin of the confusion in the incorrect assignment of buildings to two owners. A few facts and figures on Joseph Mohr: He was born at the Steingasse when this lane was an area where poor people lived. He was an illegitimate child to a young woman that worked with textiles. He was born in 1792 (only months after the death of Mozart) and grew up in poverty - note that this was the time of Salzburg′s declining economic confidence, due to the looting in the course of the Napoleonic Wars and resulting loss of independence. In 1815, Joseph Mohr became a priest (which required a special Papal permission because he had been conveiced illegitimately), and served first in Mariapfarr - where he probably wrote the poem "Silent Night" around 1816. In 1818, when he served in another community in Oberndorf, he joint efforts with the local teacher Franz Xaver Gruber, who composed the tune for what was to become the World′s most famous Christmas Carol.